MRI Sagittal and Axial T2 images at the level of conus shows peri medullary T2 flow voids suggestive of Vascular malformation. 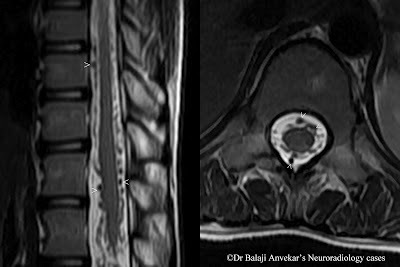 Vascular malformations of Spinal cord represent a heterogeneous group consists of spinal arteriovenous malformations (AVMs), dural arteriovenous fistulas (AVF), spinal hemangiomas, cavernous angiomas, and aneurysms. Among these AVMs and AVFs are most prevalent spinal vascular malformations. The most simple classification is extramedullary (80%) or intramedullary. • Type 1: These are Dural AVF, the most common type of malformation, accounting for 70% of all spinal vascular malformations. Here radiculomeningeal artery feeds directly into a radicular vein, usually near the spinal nerve root. The AVF creates venous congestion and hypertension, resulting in hypoperfusion, hypoxia, and edema of the spinal cord. Due to the slow flow nature of type 1 AVFs, hemorrhage rarely occurs. Exact etiology of its development is still unknown. Most frequently found in men between the fifth and eighth decades of life. Most commonly found in the thoracolumbar region. • Type 2: Referred to as a Glomus AVM, consist of a focal tightly compacted group of arterial and venous vessels (nidus) inside a short segment of the spinal cord. Multiple feeding vessels from the anterior spinal artery and/or the posterior spinal circulation typically supply these AVMs. The abnormal vessels are intramedullary in location, may reach surface and sometimes subarachnoid space if extensive. Are the most commonly encountered intramedullary vascular malformations, representing about 20% of all spinal vascular malformations. Usually present in younger patients with acute neurologic deterioration hemorrhage. The rebleed rate is 10% within the first month and 40% within the first year. • Type 3: Referred to as Juvenilte AVM, are extensive lesions with abnormal vessels that can be both intramedullary and extramedullary in location. Typically found in young adults and children. • Type 4: Also known as pial AVFs, these malformations are intradural extramedullary AVFs on the surface of the cord that result from a direct communication between a spinal artery and a spinal vein without an interposed vascular network. Usually seen in patients of third to sixth decade of life. Anson JA, Spetzler RF. 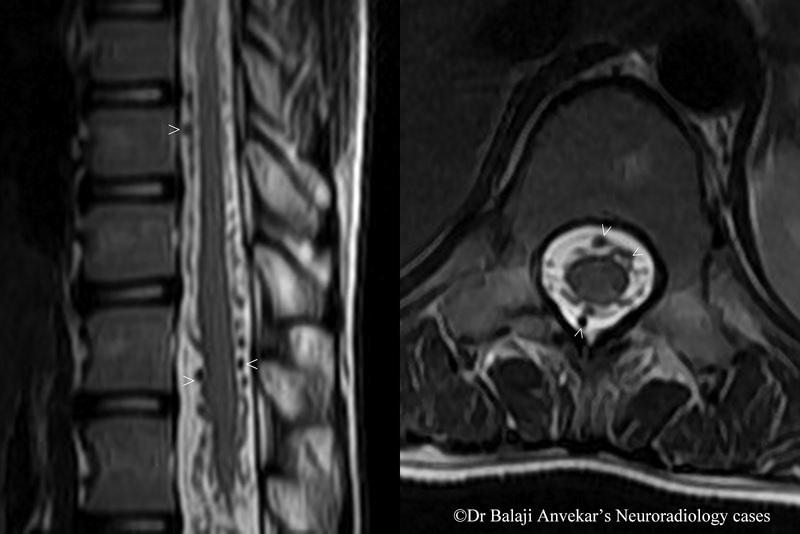 Interventional neuroradiology for spinal pathology. Clin Neurosurg. 1992;39:388-417.